The Charlotte City Council is considering an unusual recycling program in partnership with Coca-Cola Bottling Co. Consolidated. Put a Coca-Cola sticker on your recycling bin next year, make sure you follow city recycling rules, and you could win $50. At first I did not like this idea, but after thinking it over, it is worth a try to encourage folks to recycle. As a first grader in the late 1950s, my class went to a local Coca-Cola bottling plant as a field trip, although we were not allowed to drink soft drinks in school. Milk, delivered in small glass bottles with a cardboard pull-top, was the only drink offered. These milk bottles were collected and refilled. I can’t remember if we were given the forbidden Coca-Cola during the tour, but I remember watching 6-oz glass bottles being filled with the soft drink. We knew that the bottles on the assembly line were probably some that we had used. We would take our empty bottles to the grocery stores and receive a few pennies for them. It was a respectable way for a child to earn money for candy or the occasional Coca-Cola, which was a treat, not a daily diet. After the tour, we were given a miniature plastic (oops, there’s that word) case full of empty Coca-Cola bottles. I still treasure mine. It’s an antique that is probably e-BAY-able. No, I don’t want to go back to the 1950s, but I would like to see glass bottles that can be reused. 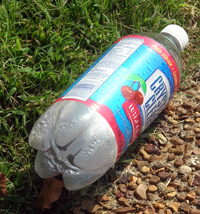 Then when people litter, at least those of us who pick up their trash could earn a few dollars from it, although we probably wouldn’t earn enough to buy a six-pack of soda these days.